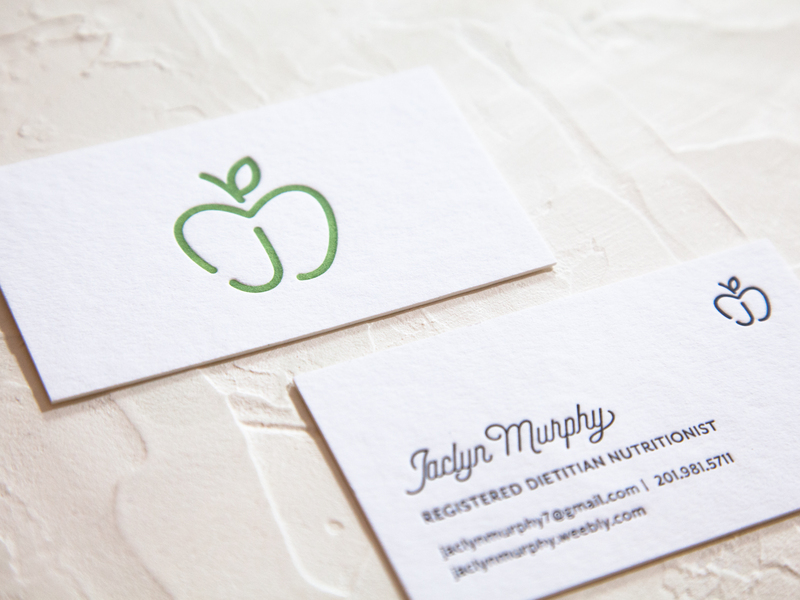 Jeanette Pidi designed these business cards for Jaclyn Murphy, a nutritionist. “This project came to us from a nutritionist looking for a unique logo design and supplementary business cards. The client requested the logo include fruits or vegetables to convey the image of health and nutrition. After many sketches, we came up with the idea to manipulate her initials to form the shape of an apple. The simple, clean logo promotes the idea of simple, clean eating. A vibrant green color was chosen to incorporate freshness and nature,” Jeanette said. Jeanette and her team not only designed the visual identity but they handled the printing as well. “These business cards were letterpress-printed, leaving a soft but impactful impression in the text and lines. Letterpress is a centuries-old form of relief printing where text and images are impressed halfway into the paper. This process is very hands-on. The ink is laid by hand, the paper is hand-fed sheet-by-sheet, and the machine is powered by foot pedal. The cards are printed on thick, cotton paper, which has a subtle textured feel and allows for a deeper, more pronounced impression,” Jeanette explained. The design leaves enough white space to make the logo pop on a clean interface, creating a refreshing and impactful design that will leave a lasting impression.